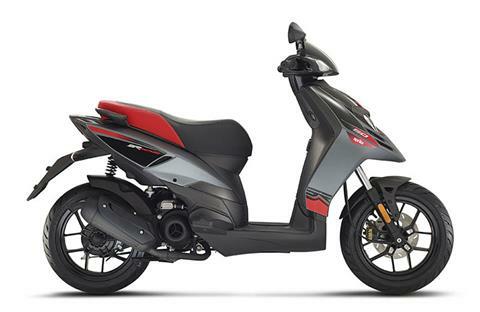 SCOOTER: The "fun" spirit of the Aprilia sport bike is without a doubt the spirit tied to the world of Supermotard bikes. Born as a street version of off-road bikes, Supermotards combined the enduro bikes' ease of riding with set-ups and performance for the asphalt. The new SR Motard brings the spirit of great Aprilia Supermotards such as Dorsoduo and SXV into the SR sport scooter family. The design reflects the character of Aprilia SR Motard which, derived from the solid technical base of best seller, Typhoon, evolves toward a brilliant and fun ride. The decidedly sporty handlebar, the light unit included in the shield and above all the pronounced "beak" on the front wheel (reminiscent of the off-road world) characterize the front end. 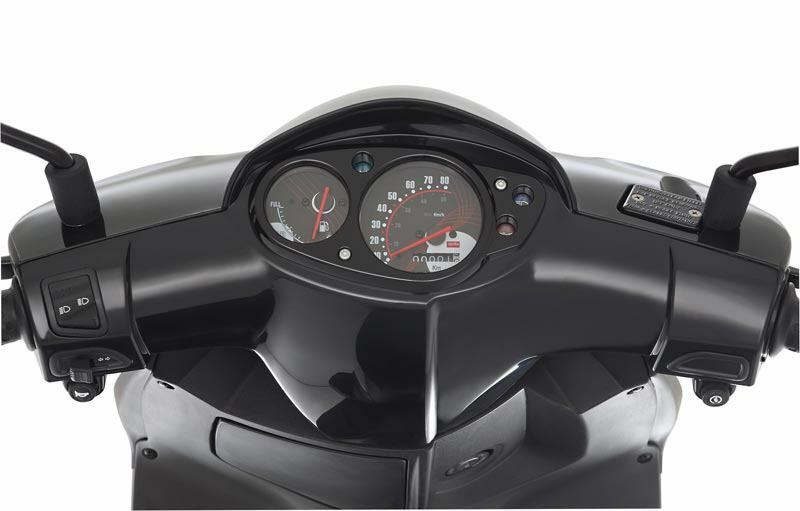 The flat footrest, in addition to ensuring convenient and riding comfort, improves the load capacity, thanks to the hook in the leg shield back plate. The large black 14 in. wheels with five doubled spokes show of a decisive and sporty design drawn from the Aprilia racing bikes. Sleek and spirited, the SR Motard rear end holds a large and comfortable saddle that bears the colored graphics of the body on the sides, a refinement which enhances the liveliness of a vehicle born to make every city ride fun. The large helmet compartment can hold a flip up helmet. FRAME: The frame in steel tubing holds a sturdy upside down telescopic fork while the rear operates a dual action single hydraulic shock absorber linked to the transmission unit that works as a swingarm. The large 14 in. wheels are shod with sport street tires. Braking safety is guaranteed by the 220 mm front disc backed up by the powerful 140 mm modulable rear drum.